The award-winning former Financial Times security correspondent Mark Huband here takes us deep inside this new, unseen world of spies and intelligence. With privileged access to intelligence officers from Rome to Kabul and from Khartoum to Guantanamo Bay, he reveals how spies created secret channels to the IRA, deceived Iran’s terrorist allies, frequently attempted to infiltrate al-Qaeda, and forced Libya to abandon its nuclear weapons. Using accounts from ex-KGB officers, Huband vividly describes the devastation caused by the West’s misreading of Soviet intentions in Africa, and explains how ill prepared Western intelligence agencies were when the Cold War was replaced by the global threat from al-Qaeda and its affiliates. 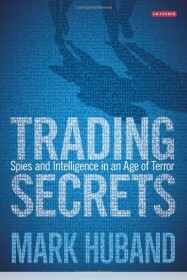 Benefiting from privileged access to intelligence sources across the world, Trading Secrets provides a unique and controversial assessment of how the revolution in spying led to the creation of the prison camp at Guantanamo Bay, and draws upon exclusive interviews with serving officers in assessing the ability of the major intelligence agencies to combat the threat of twenty-first century terrorism. Mark Huband’s ‘Trading Secrets’ gives a glimpse of what spy agencies actually do and how they are evolving to combat new 21st-century threats…He argues that undercover agents are often most useful not when they are spying on a country’s enemies, but when they are talking to them. He gives new details about the role that Britain’s Secret Intelligence Service (SIS, commonly called MI6) played in opening channels of communication with the IRA in Northern Ireland, and with Colonel Qaddafi’s regime in Libya…He concludes that spooks are “awash with more information, insight and knowledge than ever before”, but that the “intrinsic power” of intelligence has waned. One reason is that some of the finest spies are being lured away by the private sector. It greatly rewards those with a background in secret government service—and not only because spycraft has given them exceptional people skills.